Lilly Pierce, a 12 year old at Cedar School, had a hat trick in leading a BVI U15 Girls Football team to a 5-0 victory over St. Thomas’ Laraza Football Club on Saturday at the A. O. Shirley Recreation Grounds. The Boys team fell to their male counterparts 6-2, in the matches that are part of the BVI Football Association’s 40th Anniversary activities. This Sunday at 5 p.m. a women’s match between the USVI and BVI is scheduled. Pierce said she was surprised. “I didn’t know that we are going to win by that much,” she said. Laresha “Lala” Martin and Kayla Bolus also scored. improvement between the first and second halves despite the 5-0 score. Captain Ali Bartsch said she felt they did well as a group playing in their first game, because it has been difficult getting girls on St. Thomas to come out and play. In the Boys match, Captain Grant Farrell scored twice with other goals coming from Kegan Barnes, Ludavich Ultimez, Carson Kendal and Camden Newton in their 6-2 triumph. 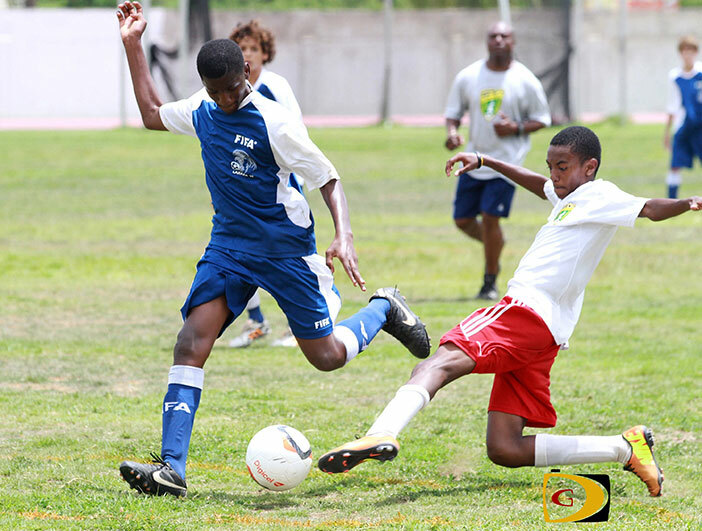 Giovani Grant and Lucha Chalwell scored BVI goals. Limeburner said his team also player here in May and they enjoyed the matches.